Lean Thinking: Standard Work or Training? How can I get all the information I need to put down onto a 1 page document? What’s interesting is that people want to write down absolutely everything about the task and put it into a Standard Work document. This includes not just “What to do”, but “How to do it” and even “Why we do it that way”. What they are trying to do is to mimic their Standard Operating Procedures (SOPs), which are often great volumes of documents buried in a computer system that nobody can or does read. Why don’t people read them? Their sheer size dictates they will never be read. Many times I’ve seen a 7 page introduction before the task details. The details themselves are written out in English with no visual indicators, diagrams or pictures. (This is done since the visuals take up too much memory in the computer). Then there is the perfunctory closing pages which gives a 10 – 15 page document on one task. No surprise that no one reads them. 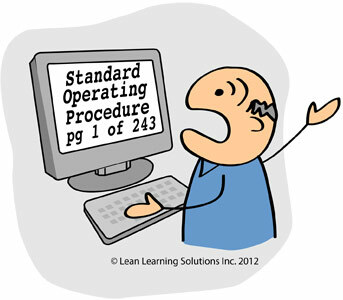 When I’m at an organization, I like to ask to see the procedures and am told – “They are in the computer”. I then ask, can you find them for me and pull them up. After several minutes of trying, inevitably, the person says something like “The systems not responding” or “Somebody moved them” or “They used to be here”. These organizations forget the purpose behind Standard Work, that is, to reduce waste and variation and to form a foundation for problem solving. Standard work is there to tell us when we can’t meet the standard due to abnormalities in the process. These get surfaced and problem solved by the team so the entire process gets stronger and stronger. The standard work constantly changes over time as the people who own the standard work develop new more waste free ways of doing the work. Contrast that to large SOPs. Can you imagine the people who actually do the work, changing these routinely? People also fail to distinguish between Standard Work and Training. The purposes are different although in many cases organizations mix the two together. I like to keep them separate. Standard work is there for qualified team members to use and to improve. A training system is there for new team members; to build their capability and bring them up to speed while ensuring the quality of their work. This is where the “Why” and “How” behind the “What” is critical. Mixing the two together leads to confusion and to a lack of engagement of people in driving improvement. Standard Work or Training – they are related but different. You need a system for both.